The evolutionary conserved autophagy process is under renewed research interest with the discovery of the ATG gene products and the link between autophagy and aging as well as human diseases. A suggested role for autophagy in programmed cell death and cell cycle progression along with further elucidation of the autophagy mechanisms and their regulation are also under investigation. We offer a selection of autophagy related antibodies and cathepsin detection kits, all performance guaranteed in many popular applications, for the study of upstream events, autophagy pathways and lysosome detection. Fig. 1. Paraffin embedded human brain (cerebellar cortex) stained with Goat Anti-Human PI-3 Kinase p110 Alpha Antibody (AHP1898). Cellular stress conditions initiate upstream events through the MAPK/Erk1/2, PI3K/AKT and mammalian target of rapamycin (mTOR) pathways with mTORC complexes leading to the autophagy mechanisms macroautophagy, microautophagy and chaperone-mediated autophagy (CMA) in eukaryotic cells. Fig. 2. Mouse peritoneal macrophages stained with FITC labeled Anti-Mouse LAMP (CD107b) Antibody (MCA2293F) following permeabilization with Leucoperm Reagent (BUF09). Macroautophagy is the most studied pathway involving the cellular degradation of cytoplasmic proteins, bulk cytoplasm, dysfunctional organelles and intracellular pathogens (innate immunity / cell defense mechanism). This process involves the formation of a phagophore which develops into a transport vesicle called the autophagosome containing the cytoplasmic constituents or organelles. The autophagy machinery, including the phagophore assembly site / pre-autophagosomal structure (PAS), and its regulation involves more than 30 autophagy related genes (ATG Proteins) including beclin 1, activating molecule in beclin-1-regulated autophagy (AMBRA1), damage-regulated autophagy modulator (DRAM), lysosome-associated membrane proteins (Lamp1 (CD107a) & Lamp2 (CD107b)) and microtubule-associated proteins 1A/1B light chains 3A/B (MAP1LC3A/B). Fig. 3. MAP1LC3A/B Antibody (1:5,000 diltution) western blot of wild-type (WT) and Atg5 knockout (KO) cells ( image courtesy of N. Mizushima). Microtubule-associated proteins 1A/1B light chains 3A/LC3A and 3B/LC3B (MAP1LC3A/B) are ubiquitin-like proteins used as reliable markers for monitoring autophagy. MAP1LC3A/B is commonly further abbreviated to LC3. A popular method for detecting autophagy uses antibodies specific to LC3 to identify LC3-positive structures such as autophagosomes. Since LC3 is the only protein identified on the inner and outer membranes of autophagosomes, MAP1LC3A/B antibodies provide a quick detection method. Click here to learn more about our LC3 antibody, which shows superior results in western blotting. Fig. 4. Detection of autophagy using Autophagy Probe Red. Starvation was used to induce autophagy. Untreated cells (red) and cells incubated in HBSS for 2 hr and 10 nM bafilomycin A for 2 hr (blue). After staining with Autophagy Probe Red for 30 min, cells were washed and analyzed on the ZE5 Cell Analyzer using the 561 mm laser and 640/20 filter. Autophagy Probe Red is a cell-permeant, aliphatic molecule that fluoresces brightly when inserted into the lipid membranes of autophagosomes and autolysosomes. Autophagy is a dynamic process typically divided into three stages. During stage one, cytoplasmic components targeted for degradation are sequestered within a double-membrane phagopore (also called the isolation membrane). This results in the formation of a double-membrane vesicle called the autophagosome. During stage two, the autophagosome fuses with a lysosome to form the autolysosome. Degradation of the autophagosomal contents occurs during stage three (Mizushima and Komatsu (2011), Hundeshagen et al. 2011). 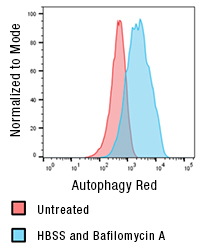 Autophagy Probe Red can be readily detected in cells undergoing autophagy quickly and easily by flow cytometry, with optimal excitation at 590 nm and peak emission at 620 nm (ZE5 Cell Analyzer settings: 561 nm laser and 615/24 or 640/20 filter). The autophagosome fuses to a lysosome forming an autolysosome where enzymes, like cathepsins and permeases, hydrolyze and degrade the cargo for its release back into the cytoplasm for recycling. Fig. 5. Cathepsin B staining in Jurkat T cells and HeLa cells after treatment with leupeptin. 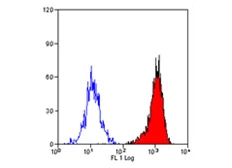 A. Jurkat cells were treated with leupeptin (red histogram) or were untreated (green histogram). They were then stained using a Green Cathepsin B Kit (ICT9152) and analyzed by flow cytometry using a ZE5 Cell Analyzer. HeLa cells were B. untreated or C. treated with leupeptin and stained with Magic Red Cathepsin B Kit (ICT937), counterstained with Hoechst. 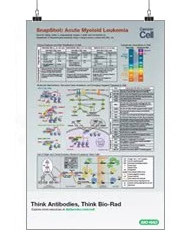 Bio-Rad offers a range of Cathepsin Antibodies and Detection Kits; further details can be found here. Future detailed understanding of autophagy mechanisms and their role in human disease and innate and adaptive immunity is needed, before potential therapeutic intervention can be developed. Autophagy is thought to be closely linked to apoptosis - take a look at our range of apoptosis antibodies and kits. Chu CT et al. (2004). Oxidative neuronal injury. The dark side of ERK1/2. Eur. J. Biochem. 271: 2060–2066. Flotte, TJ et al. (1983). Dendritic cell and macrophage staining by monoclonal antibodies in tissue sections and epidermal sheets. Gozuacik D. and Kimchi A (2004). Autophagy as a cell death and tumor suppressor mechanism. Ho MK and Springer TA (1983). Tissue distribution, structural characterization and biosynthesis of Mac-3, a macrophage surface glycoprotein exhibiting molecular weight heterogeneity. Liang XH et al. (1998). Protection against fatal Sindbis virus encephalitis by Beclin, a novel Bcl-2-interacting protein. Liang XH et al. (1999). Induction of autophagy and inhibition of tumorigenesis by beclin 1. Nishimoto S and Nishida E (2006). MAPK signalling: ERK5 versus ERK1/2. Raman M. et al. (2007). Differential regulation and properties of MAPKs. Reif K et al. (1993). Divergent regulation of phosphatidylinositol 3-Kinase P85 alpha and P85 beta isoforms upon T cell activation. J. Biol. Chem. 278: 10780-10788. Semba S et al. (2002). Down-regulation of PIK3CG, a catalytic subunit of phosphatidylinositol 3-OH kinase, by CpG hypermethylation in human colorectal carcinoma. Serajee FJ et al. (2003). Association of INPP1, PIK3CG, and TSC2 gene variants with autistic disorder: implications for phosphatidylinositol signalling in autism. Shamji AF et al. (2003). Integration of growth factor and nutrient signaling: Implications for cancer biology. Stern DF (2004). More than a marker… Phosphorylated Akt in prostate carcinoma. Clin Cancer Res. 10: 6407-10. Tatin F. (2010). Sodium fluoride induces podosome formation in endothelial cells. Turjanski A et al. (2007). MAP kinases and the control of nuclear events. Woodfield R et al. (2001). The p85 subunit of phosphoinositide 3-kinase is associated with beta-catenin in the cadherin-based adhesion complex. Biochem. J. 360: 335 - 344. Espinosa,I et al. (2009). Coordinate expression of colony-stimulating factor-1 and colony-stimulating factor-1-related proteins is associated with poor prognosis in gynecological and nongynecological leiomyosarcoma. Am J Pathol. 174: 2347-2356. Hundeshagen et al. (2011). Concurrent detection of autolysosome formation and lysosomal degradation by flow cytometry in a high-content screen for inducers of autophagy. Iwata A et al. (2005). HDAC6 and microtubules are required for autophagic degradation of aggregated Huntington. Kopitar-Jerala N et al. (2001). Anti-Cathepsin L monoclonal antibodies that distinguish cathepsin L from cathepsin V.
Martin SL et al. (2010). Association of airway cathepsin B and S with inflammation in cystic fibrosis. Mizushima and Komatsu (2011). Autophagy: renovation of cells and tissues.